author interview ... with me. 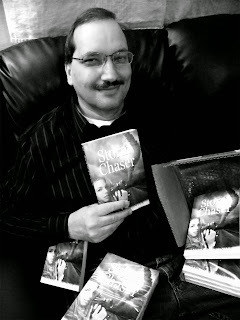 Hey, I'm an author! Would you like to know some background stuff about me and my writing history? It’s a bit lengthy—Fiona asks a lot of questions!—but think of it as an interview novella, rather than an interview short story. She pries out of me how I came to be me, author-wise: a six year old fanfic writer, Star Trek theft, how a science fiction writer got published in the romance genre, and why my main influence is still a children’s author, among other things … all the way up to my retirement plans. Oh, and there’s a sample of Hoosier Hysterical, titled “Facts is Facts”. Well, I thought it was interesting to write. Like therapy, only without the insurance bill. I suspect it depends on your definition of "author".